I’m back at my computer after a fantastic month in North America. This summer we traveled from coast to coast. One of the highlights of the vacation, for me, was a stop at the Grand Canyon. Although there is photographic evidence that I visited the Grand Canyon as a small child, I don’t really remember it so it was like seeing it for the first time. I know it’s a cliché to say words and photos don’t do it justice, but unfortunately it’s true. My breath was taken away. 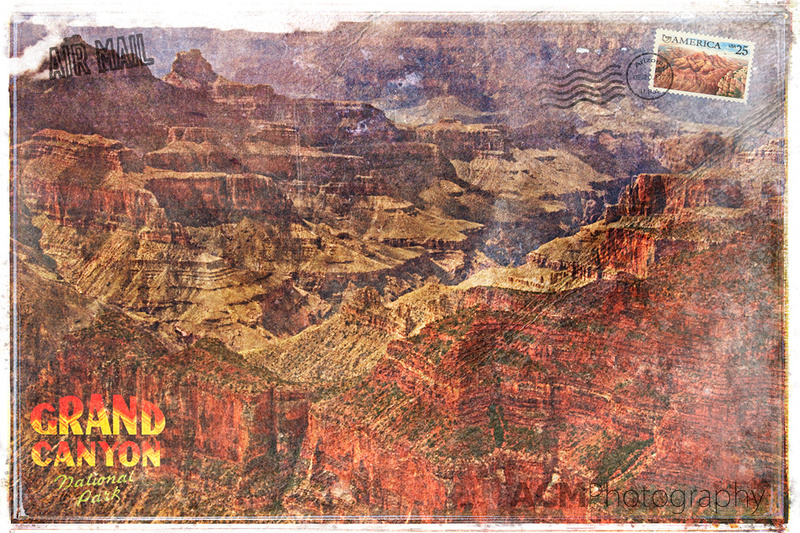 I’ve tried to pay tribute to the beauty of the Grand Canyon with this Forgotten Postcard. I hope you enjoy it. This entry was posted on Wednesday, September 8th, 2010 at 12:56 and is filed under Digital Art, Forgotten Postcards and tagged with america, arizona, art, digital art, Forgotten Postcard, Grand Canyon, landscape, national park, photoshop, united states. You can follow any responses to this entry through the RSS 2.0 feed. WOW!!! That’s awesome! It is a great addition to the series 🙂 I agree that it is a spectacular spot to behold and the north rim was definitely worth the drive… way less people than I imagine are at the south rim… and the drive in through the upper desert then the forest and meadows is just a beautiful way to get there. Great work! Thank you! Agreed… I’m not sure why more people don’t go to the North Rim but in this case, I’m glad they didn’t!